India experienced a significant energy crisis on Tuesday 31 July 2012 when three of its regional power grids collapsed. Over half the country was impacted on leaving 620 million people without government-supplied electricity for several hours in what was the world's biggest blackout to date. 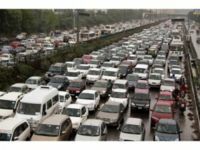 Traffic lights out, causing widespread traffic jams in New Delhi. Emergency workers rushed generators to coal mines to rescue miners trapped underground. India's power grid has grown significantly in recent years and is now operating at or over its capacity. However, one-third of India's households still do not even have electricity to power a light bulb, according to last year's census. Decentralised power generation using wind power and photo voltaics is a possible solution to this problem. Solar-power microgrid service in rural villages: Startup Mera Gao Power wants to have a total of 70 villages electrified with its solar panels, cell phone charging service, and distribution lines by the end of 2012. One of India’s first megawatt-scale rooftop solar projects: Azure Power, a startup run by entrepreneur Inderpreet Wadhwa, is developing a project that puts solar panels on dozens of rooftops and shares revenues from power sales with the building owners. 600 MW of solar in Gujarat: The Indian state of Gujarat in April threw a big party to celebrate the commissioning of 600 MW of solar energy projects over a year. The aspirational country goal: The National Solar Mission in January 2010 set a goal of installing 20 GW of grid-connected solar and 2 GW of off-grid solar by 2022 — that’s 3 percent of the country’s power using solar by 2022. SunEdison experimenting with rural projects, too: While project developer SunEdison has brought 45 MW of solar projects in Gujarat online, it is also looking at how it can make solar panel projects work in rural villages. Selling solar like cell phone service: Startup Simpa Networks has developed a home solar panel product for off-grid customers controlled by a mobile, pay-as-you-go system. Solar teaming up with water use: One of SunEdison’s solar projects is a 1 MW installation over nearly half a mile of the Narmada Canal in the state of Gujarat. Solar lanterns: Startup d.light recently celebrated its fifth anniversary and the company has reached the goal of 7 million people using its solar-powered products (see photo) in 40 countries. Giant solar thermal projects: Areva Solar is building a 250 MW solar thermal project in the northwestern part of India (in the state of Rajasthan) that will use mirrors to concentrate sunshine onto water filled tubes to produce steam — steam that will drive a turbine and make electricity. Solar for cooking, heating, making stuff: A company called Flareum sells solar concentrating systems that can be used for cooking, and for producing steam and heat for industrial applications. This page was last modified 00:28, 24 August 2012.